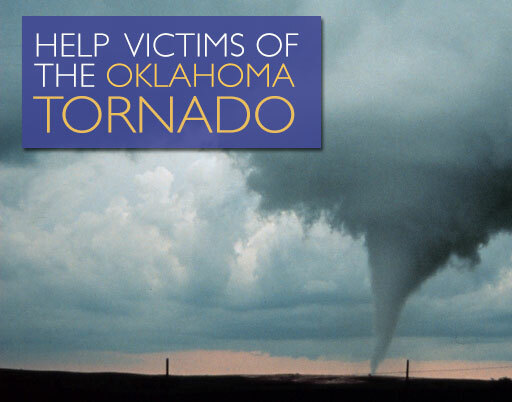 A violent, massive tornado struck the Oklahoma City suburbs with vengeance Monday, May 20. In what is described as one of the most destructive tornadoes in recent history, the tornado, nearly 2 miles wide with wind speeds of up to 200 miles per hour, left extensive damage and lives that are forever changed in its wake. As details continue to emerge in the tornado’s aftermath, President Obama has declared it a major disaster and ordered Federal aid to supplement state and local recovery efforts. Homes, schools and businesses were leveled in Moore, a community of about 55,000 people. The tornado was on the ground for about 40 minutes, leaving behind a debris field 20 miles long and several miles wide. Two elementary schools, Plaza Towers Elementary and Briarwood Elementary, were directly hit and destroyed. Close to 200 people are being treated for their injuries, including 70 children. Families have been ripped apart and their homes no longer exist. Across the country, hearts are heavy with the loss of so many young lives. My mother-in-law just passed away and she has sooooooooo many clothes that still have all the price tags on. We would like to donate everything to help the people that have lost everything due to this tragic storm. I just need to know how I go about sending these items to you. How can I donate t-shirts and clothing to Oklahoma City residents? I want to help with Oklahoma and I have a bunch of clothes but I don’t know how to get them to the people. Any help or ways I can?